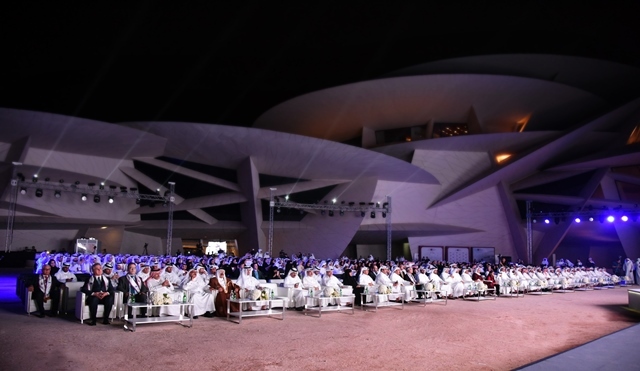 Qatar Leadership Centre (QLC) held its annual graduation ceremony this evening at the National Museum of Qatar. Sheikha Al Mayassa bint Hamad bin Khalifa Al Thani, Chairperson, QLC Board of Directors honoured the ceremony. present on the occasion were Sheikh Dr. Abdulla bin Ali Al-Thani, Managing Director and Member; Yousuf Mohamed Al Othman Fakhroo, Minister of Administrative Development, Labour, and Social Affairs, Salah bin Ghanem Al Ali, Minister of Culture and Sports, Sultan Bin Rashid Al-Khater, Undersecretary of the Ministry of Economy and Commerce, ministers, dignitaries, members of the diplomatic corp., members of the business community and guests. 118 Qatari graduates were honoured in the ceremony. These graduates have completed one of three courses of study – the Executive, Government, or Rising Leaders programs. The graduates constitute the sixth class of QLC since its establishment by Amir of Qatar Sheikh Tamim bin Hamad Al Thani as a national platform for leadership development. This year QLC marked the addition of an Executive Master’s degree program in leadership offered by Georgetown University, which is built on the foundational courses of the QLC program. There are 28 Qataris currently enrolled in the inaugural program. She said “We gather tonight at the new National Museum of Qatar, a masterpiece of art in the service of education. It connects Qatar’s past with its future, its rich heritage and traditions are the foundation of its informed vision of development. In a similar way,” she added ‘ the QLC graduates are guided by the strength of our national heritage and the benefits of education for a promising future’. QLC’s key partnerships leading institutions include University of Cambridge, University of Chicago Booth School of Business, Duke University, Georgetown University, Harvard University, HEC Paris, Rice University, University of Oxford, and Al Jazeera Media Institute.